A Turning Point in the Markets? It seems sometimes that the outlook for the global economy and the markets has been unchanged for years. Each year since the end of the recession has begun with forecasts that the U.S. economy would break out of its below-trend growth mode, only to see expectations dashed. Europe has been mired in recession as it struggles with heavy post-crisis debt burdens. Growth has slowed in the emerging markets, ending the commodity boom of the first decade of this century. Interest rates, while no longer at the lowest levels in a generation, are still low, and there is no sign of inflation on the horizon. Meanwhile, the U.S. stock market has continued to power upward, helped along by quantitative easing and quarter after quarter of strong corporate earnings growth. Evidence is accumulating, however, that some of the trends that have driven the markets in recent years have reached a turning point. Arguably the most looked-for inflection point in global markets has been the end of the 30-year plus bull market in bonds. Many market participants had become persuaded that point had arrived in May when Fed officials began talking about tapering the pace of bond purchases in their quantitative easing program. U.S. Treasury yields backed up sharply since May, making real 10-year Treasury yields (such as those on Treasury Inflation Protected Securities) positive for the first time in over a year and a half. Investors that had stretched for yield in high dividend-paying stocks and emerging markets stocks and bonds exited those asset classes, and the price of gold, which earns no interest, fell. Investors in bonds are on track to lose money for the first time in many years. Then came the Fed's decision, announced at the end of September's FOMC meeting, to not taper their $85 billion per month Treasury bond and mortgage-backed securities purchases. The markets were surprised, and Treasury yields fell â€” but not by much. Ten-year Treasury yields fell from their recent high of 2.99% in early September, by a meager 15 basis points as of this writing, as the bond market is still pricing in a rise in yields. It appears that market participants have concluded that the Fed has postponed tapering, but not ruled it out indefinitely. The stock market, meanwhile, greeted the Fed's decision to continue quantitative easing at an unchanged rate with relief if not downright enthusiasm. The reaction is understandable given the boost the three quantitative easing programs have given to stock prices. However, strong corporate earnings have also contributed to the rise in the market over the past four years. Earnings have been better than the consensus has expected every quarter since the end of the recession, and corporate profits are at an all-time high. The support the stock market has enjoyed from rising earnings, however, may be waning. To be sure, the consensus among analysts is that earnings per share on the S&P 500 will grow by 13% in 2013 and another 12% in 2014, which in the face of below-trend GDP growth is remarkable. Yet revenue growth has not kept pace with bottom-line earnings growth, leading many observers to question whether the double-digit growth in earnings â€” much of which reflects cost cutting and improvements in operating efficiency â€” can be sustained. Year-over-year growth in S&P 500 revenues was only 3.4% during the second quarter, and is unlikely to have been much higher in the third quarter given that business sales were up only 5% year-over-year in July, according to Yardeni Research. 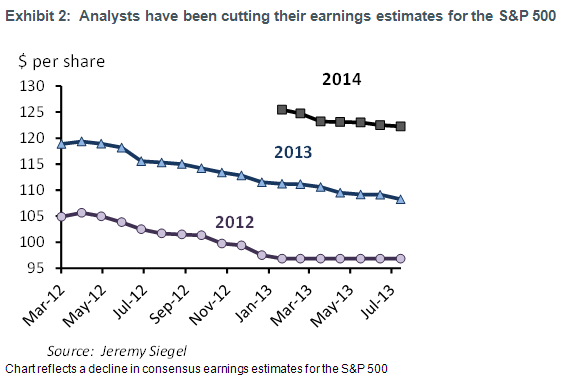 Meanwhile, analysts have been paring back their estimates for both 2013 and 2014 earnings. Long before earnings become an issue, however, the market's focus is likely to shift to the looming confrontation between the White House and the House of Representatives on fiscal policy. Congress will need to approve a continuing resolution by October 1 to prevent a government shut-down, and will then have to vote on October 18 on whether to extend the debt ceiling. The debates are certain to be acrimonious and no permanent plan for fiscal stability is likely to emerge. It is possible that the markets are sufficiently jaded that they will shrug off the discord in Washington and price in stop-gap solutions. 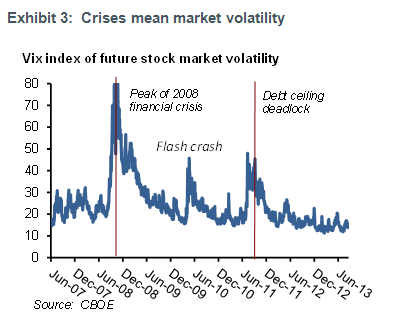 However, the risk of a severely negative market reaction, such as occurred during the debates on the extension of the debt ceiling in August 2011, cannot be ruled out. This risk, combined with the likelihood that tapering will return as an issue in coming months, makes the U.S. stock market less attractive now than it was earlier this year, in our view. While risks in the U.S. stock market are rising, in our view, the outlook for foreign markets is looking up. Readings on JP Morgan's global Purchasing Managers Index, a widely followed gauge of global demand, have risen to their highest levels for output and new orders since the most recent soft patch began in early 2011. This points to a pickup on growth momentum in coming months as manufacturers respond to rising demand. The outlook for Europe, which is benefiting from improved financial conditions and liquidity support from the European Central Bank, is improving. The consensus among economists reporting to Bloomberg is that growth will resume in Europe, which has been in recession since early 2012, by the end of this year. Monetary easing and a falling exchange rate, meanwhile, promise to put growth in Japan on a better footing in coming quarters and end the threat of deflation. Growth in the emerging markets is likely to follow any pickup in economic activity in the developed world. Within emerging markets, the faster pace countries in Asia and Latin America with close trade ties to the developed world will likely lead relative to others, such as Russia, with weaker links. As the global economic outlook remained unchanged for many quarters, the broad outlines of our investment strategy have stayed the same. The main elements of that strategy have been to maintain a substantial allocation to equities, to avoid long duration in fixed income and favor bonds that provide a spread over U.S. Treasuries, to stay diversified using alternatives, and to prefer U.S. to foreign assets. Now that risks are rising in the U.S., in our view, and the outlook is improving abroad a shift in strategy is warranted. It still makes sense to maintain a substantial allocation to equities, in our view, but to tilt that allocation toward international markets, especially in the developed world. 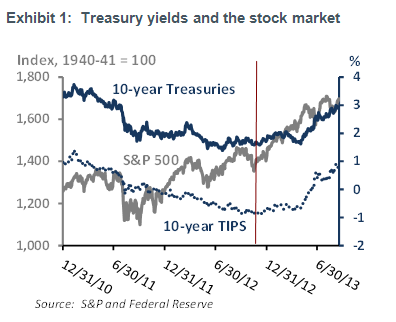 While the Fed has put tapering on hold, the risk of an unanticipated rise in rates is not over. This argues for continuing to avoid long duration and continuing to favor bonds that trade at a spread over Treasuries. The argument for using alternatives to diversity, meanwhile, remains as strong as ever, in our view.